Despite disruptions caused by Hurricane Harvey, chemical production volumes continued to increase in 2017 (up 0.8%), with robust growth expected in 2018 and 2019 (3.7% and 3.9% respectively), according to the American Chemistry Council. The upturn is sustained by robust demand from the automotive and construction sectors, capital investment and the fact that many chemical subsectors continue to enjoy the cost advantage of shale gas. The US has moved from being a high-cost producer of key petrochemicals and resins in the past to being the world’s second lowest cost producer. Exports of US chemicals linked to shale gas are projected to reach USD 123 billion by 2030. Chemical producers are clearly looking to take further advantage of continued low natural gas prices in the US, which is enabling the significant expansion of methane-based projects. The comprehensive tax reform will offer chemicals and pharmaceutical corporates based in the US a lower corporate tax rate and allows them to repatriate some of the cash they hold overseas. An influx of repatriated cash could be used to repay company debt, fuel new business development activities or reinvest in US-based projects. The large infrastructure improvements announced by President Trump soon after his inauguration would widely benefit US chemical businesses providing polymers, coatings, adhesives, solvents and other materials used in the construction industry. However, concrete measures have not been decided yet. On the contrary, currently it seems that the potential downside risks related to President Trump´s economic policies outweigh the business opportunities, after punitive tariffs have been raised on steel and aluminum imports and additional tariffs on Chinese imports worth USD 50 billion have been announced. Should international trade disputes escalate there is the immedeate risk that retaliatory measures by trade partners would hit the US chemicals industry, given its substantial trade surplus (Mexico alone accounts for more than half of the US chemicals trade surplus). 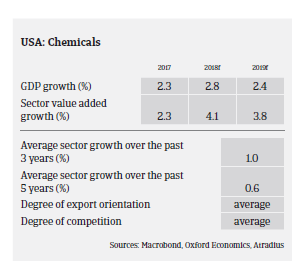 At the same time potential taxes on chemicals-related imports could find US chemicals businesses paying more for feedstocks and would negatively impact supply chains. The US pharmaceuticals sector is expected to record value added growth of 1.6% in 2018 and 2.8% in 2019. In early May 2018 President Trump voiced his intention to lower the price of prescription drugs, and while the Secretary of Health and Human Services confirmed in mid-June 2018 before the Senate Health Committee that several companies are being scrutinised, it was also said that it could take some time for price cuts to actually materialise. Drug manufacturers have yet to announce lower drug prices, and no company has publicly indicated an intention to do so. The pressure from the US administration to reduce drug prices is not expected to have a material impact on the industry in the near-term. Continued production and sales growth should be sustained by the aging “baby boomer” generation and a subsequent surge in demand for pharmaceutical/health care products. Profit margins of US chemicals and pharmaceuticals businesses are generally stable, and the amount of protracted payments is low. On average, payments in the industry take between 30 and 90 days. The number of insolvencies is low compared to other sectors, and is expected to remain so in 2018, consistent with improving demand for chemicals and pharmcaceuticals. 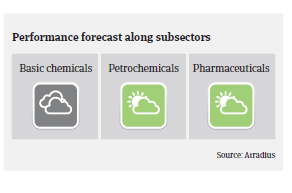 Our underwriting approach to the chemicals and pharmaceuticals sector remains generally positive to neutral for the time being. 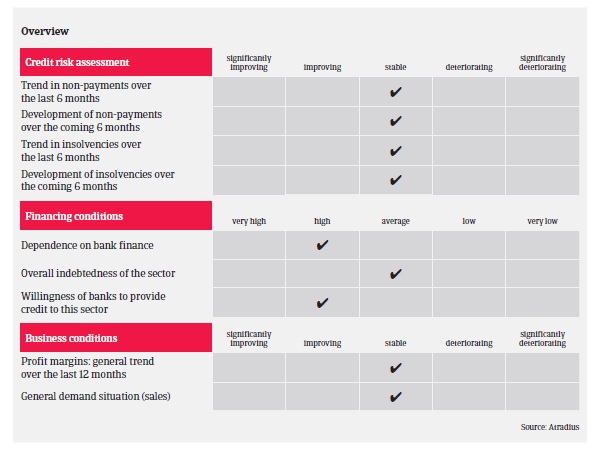 As the sector is highly fragmented and dependent on the broader economy and input costs, we scrutinise single subsector trends and end-markets. 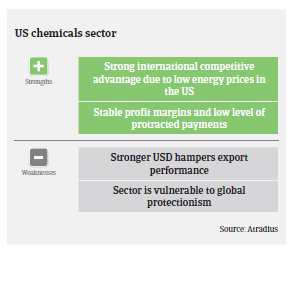 We also closely monitor US chemicals companies that do business in countries where the local currency has significantly devalued against the USD.